Tokyo (AFP) – Rescuers dramatically pulled a baby girl from a collapsed house early Friday more than six hours after a swarm of powerful earthquakes rocked southwestern Japan and left nine people dead. Video footage provided by the National Police Agency showed the tiny pink pyjama-clad baby gently carried away in a blanket by helmeted rescuers from the rubble of the home. 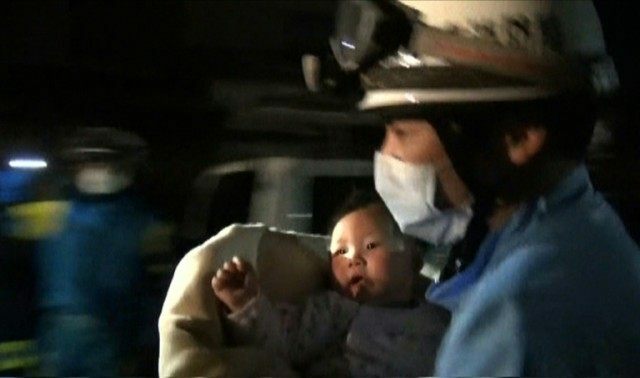 The rescue of the eight-month old girl came in the Kumamoto prefectural town of Mashiki, the locale hardest hit by the 6.5-magnitude quake that struck Thursday night. The girl whose name has not been released, reportedly did not suffer any injuries. The child’s mother, grandfather, grandmother, and older brother were in the living room and kitchen of the home as she slept in another room on the first floor when the quake shook the southern island of Kyushu, the Mainichi Shimbun daily reported. The family members, who all managed to escape, tried to rescue the baby but the house collapsed, the paper said. But a 50-member rescue team managed to pull her safely from the rubble around 3:45 am Friday (1845 GMT Thursday), Kyodo News reported. The infant’s rescue came as nine people were killed — eight of them in Mashiki — after dozens of aftershocks shook the area following the initial quake. Mashiki, a town with the population of about 35,000 people, is near the quake’s epicentre. People following news of the baby’s ordeal shared their emotions on Twitter.